So tell me. Taxidermy: cool or cruel? I've never really thought about this! Personally, taxidermy creeps me the eff out. I think it adds flair in photographs and such, but in person...bleh. Looking forward to more. New follower! I just went into the Portland Paxton Gate for the first time a couple of weeks ago! I was blown away by all that they had, but I would feel more comfortable having some of the non-taxidermy stuff they have displayed in my home: rare fossils, precious rocks and gems, and okay... bones. I do have an ostrich bone in my apartment (it's shaped like a bowl, so I use it as one)! Thanks so much for the sweet comment! I'm following you now too-great blog! In regard to the question: I have a pair of vintage antlers up in my home, and I have gotten some negative remarks on it-nothing too crazy, and more in a joking manner-but still! I know it's not quite the same-I think a stuffed peacock would get a whole new realm of negative comments! Well, there's certainly a big difference between waiting for an animal to die and preserving it and hunting it for it's fur/form/antlers, etc. I think something especially interesting is the fake tacky taxidermy impressions that stores like Urban Outfitters put out. There's a certain strange aesthetic to that - and though I don't like it, it is an alternative to the real thing. Ultimately, I think the whole taxidermy-as-decoration thing works better in editorials/photoshoots than in real life. In reality, it just end sup looking creepy haha. Great post. like this poll idea - I love when blogs are a discussion. I will have to go with cruel on this one. I love animals, I had 4 dogs, one cat, 3 bunnies so far :) and I can't even imagine something like this. This can look good in some rooms with retro, vintage style, but this is cruel. On the other side, these animals died before taxidermy, it's not like they killed them just because of that, but still...cruel. Cool blog. I fell in love with this animal hide carpet at IKEA and never really had the courage to go buy it. Nowadays one can make animal decor out of anything, no need to use real stuffed animals. I have nothing against antlers or peacock feathers, but I wouldn't like a stuffed animal in my home. First off, I just want to say thank you so much for visiting my blog. Without your comment, I never would've found your amazing blog! I really love the polls that you do, I've read through several of your previous posts and it really got me thinking! To be honest, I think taxidermy as decoration when used minimally is aesthetically pleasing, especially in photos that appear in magazines. However, it is not something I would or possibly ever want in my home space because the thought of using animals as decoration is enough to make me want to hurl just thinking about what these beautiful creatures go through. Cruel, it would be nice if it not from real animal. BTW, Paxton gate is one of my fav store, too but for plant and some weird decoration thou. Personally, I think it's a little creepy - just imagining it once alive and now stuffed makes me feel a bit uneasy lol. Yeah, I have no idea...My brother has stuffed 'animals' and to me it looks redneck - but those are kind of chic. i would have to say i think its a bit tacky, unless a designer can make it work which i havnt noticed so far. As much as I think the peacock is pretty too.. I think I have to go with cruel. Just weird to have dead animals as decorations! Love your blog by the way. Following you now! I agree with you, that could looks cool on pics but still is very cruel on reality! I'd prefer waaaay long to have statues on my home thant these animals! I think it is more creepy than anything else. Can you imagine waking up to that?? Ugh. I think it depends on the animal. I don't mind birds or animals that are hunted for used for food. But it makes me sad to see people walking on real zebra hides. No one is eating zebra meat, right??? Interesting blog post. Hunting an animal/or eating an animal for food consumption is much different (in my mind) that wearing it. As far as real antlers in the home.. well I guess it's fitting in some homes.. not in mine though. thought provoking! I do not think I'd like to have a 'stuffed' animal in my living room! Hope you are having a wonderful day! I think taxidermy is creepy because I don't like seeing a eyes looking at me - but I like using animal hide, feathers and horns as part of furniture and decor. I could handle antlers in the house as long as they aren't attached to a face! I am kind of torn about this. I think it looks amazing in pictures and the I want something for my house, but when I see them at antique stores, I get really creeped out. So I don't know if I can fully commit either way!! As great as it is to mix textures and elements (wood, iron, glass, fabric, plants...), dead animals just creep me out. Cruel. I don't want a room to evoke feelings of death, and what that animal's life had been like. And now it's on the wall. Ew. I'm not into taxidermy but as long as it's fake, it's fine with me. It creeps me out. But then again, I'm not really a fan of the antler trend either. Great discussion! Cruel! 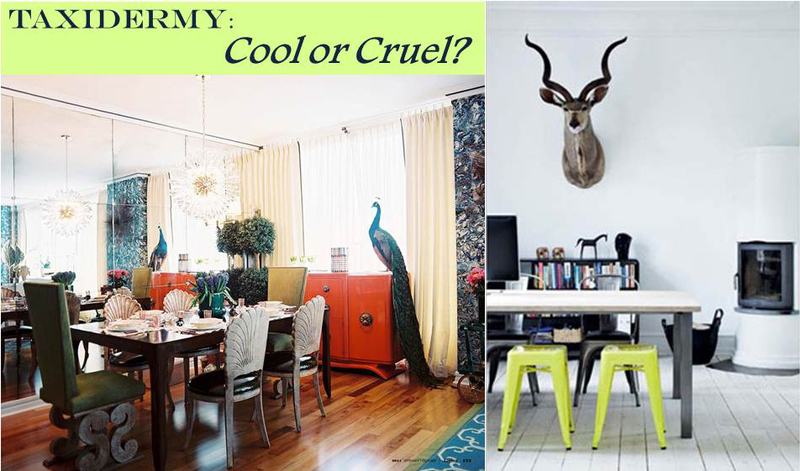 Why should an animal die to make your room look rustic? Real or fake, it glorifies hunting, which is really a sick practice. In the UK taxidermy is certainly not cruel. Taxidermists use animals that are already dead and this is highly regulated under different licences. The roads kill 104 million birds a year and the domestic cat 90 million. These carcasses will only rot. As a taxidermy collector I can honestly say that everyone I know who collects, and especially the taxidermists themselves are wildlife lovers who could think of nothing worse than killing for taxidermy. I think theirs a huge difference between game trophy and natural history that have died from natural cause or road kill, i like it myself and have no problem with it in my home, on the other hand i wouldn't have a trophy head on my wall.